A Bi-Folding door is more than just a conventional sliding door, with its sleek design it is able to create more space and harness the potential of a room whether internally or externally. When you choose a Bi-Folding door you cast away the barrier between inside and outside your home, it will effectively transform your living space into a greater social space. 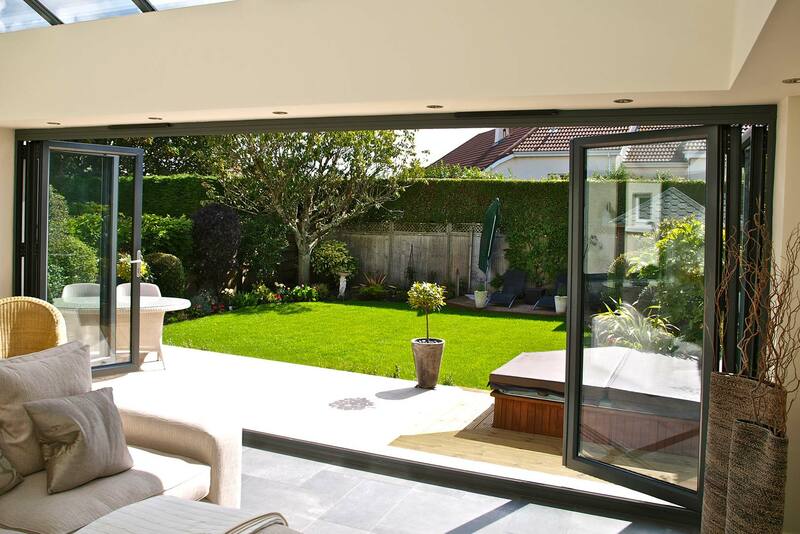 Flexibility is key to the design, Bi-Folding doors can do what conventional door design cannot. It can add and subtract space whilst maintaining the slimmest of profiles. Primary features of Bi-Folding doors include maximising all the available natural light, ensuring excellent thermal efficiency and security. Due to the ingenious design of the sliding track system, the locking system is spread over multiple points of the track – this provides a greater level of security when compared to other types of doors which tend to have one single locking point. Available in low maintenance UPVC and Aluminium with a variety of colours. We can help you select the right colour whether you want to blend in with the environment surrounding your home or make a statement – contemporary or traditional, we can find the ideal match.